Our 100% hassle-free lifetime warranty replacement warranty is sure to leave our competitors in awe. 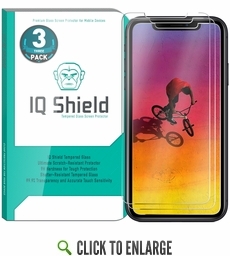 Should your IQ Shield® tempered glass screen protector for Apple iPhone XR ever need replacing, simply contact us and we will honor your request, no questions asked! That's right! Our ballistic glass Apple iPhone XR screen protectors are constructed of high-quality tempered glass that offers unmatched scratch-resistance and texture. The silky, smooth glass surface features a hardness rating of 9H that excels are resisting scratches and scrapes. Measuring at only .33mm, IQ Shield® glass offers unparalleled protection without adding unnecessary bulk. With 99.9% transparency, IQ Shield® Tempered Glass Screen Protectors for Apple iPhone XR offer the clearest screen protection when compared to other types of screens. A unique silicone adhesive allows you to easily install IQ Shield® tempered glass while preventing any bubbles from forming. Accurate Touch technology allows your screen to remain fully functional unlike other screen protectors that interfere with sensitivity.